Smart medical devices have gained traction in the recent past due to the multitude of benefits they provide to the patient and the caregiver. These devices have radically changed the way a disease is managed, by storing copious amounts of data in a logical format to draw insightful inferences. From understanding patterns of diseases or health issues, smart medical devices have largely helped users to keep an efficient tract of their health and fitness regime. Owing to these reasons, the global smart medical devices market is expected to soar at a CAGR of 7.8% to reach US$66.1 bn by 2024 as compared to US$33.7 bn in 2015. Smart medical devices are being used as important tools by physicians to detect various disease by monitoring vital signs. Chronic disease such as hypertension and diabetes have thus received a fresh perspective from both the medical industry as well as the patients. From a broader perspective, these devices have drastically reduced the workload for healthcare providers by closely monitoring patient health and taking quick action in case of any major change in the readings. The report predicts that the demand for smart medical devices will be attributable to the growing pool of geriatrics, who are prone to a wide range of illnesses. Furthermore, the rapid technological advancements in the fitness devices have also lured in a large base of consumers who are interested in monitoring their heart rate, calorie intake, and the number of calories burned. The user-friendliness of these devices is also expected to fuel the uptake of smart medical devices in the coming few years. The various products available in the smart medical devices market are On the basis of product, the global market is segmented into therapeutic devices, diagnostic and monitoring devices, and injury prevention and rehabilitation devices. Of these, the diagnostic and monitoring devices segment is expected to dominate the global market. Growing awareness toward fitness is expected to drive the uptake of these devices. The quick and easy accessibility to fitness prompts, near-accurate monitoring of health condition such as diabetes and blood pressure, and wide availability of devices in varying price range is expected to work in favor of this segment. In terms of geography, the global smart medical devices market is segmented into North America, Asia Pacific, Europe, the Middle East and Africa, and Latin America. North America is expected to exhibit excellent growth rate in the coming years. The adoption of technology in the region and its acceptability amongst the overall population is estimated to benefit the regional market. The ongoing upgradation of medical and healthcare services in the region have also played a crucial role in swift sales of smart medical devices all across North America. Some of the leading players operating in the global smart medical devices are Abbott Laboratories, Apple Inc., Dexcom, Inc., Fitbit, Inc., F. Hoffmann-La Roche Ltd., Johnson & Johnson, Medtronic plc, NeuroMetrix, Inc., Samsung Electronics Co., Ltd, and Sonova. F. Hoffmann-La Roche Ltd. These players are expected to retain the lead in the coming years due to their penetration in emerging economies and product innovation. The growing investments in the development of sophisticated products are also anticipated to drive the soaring revenues of these players in the coming few years. Smart medical devices are the electronic devices with independent processing system. Smart medical devices are useful in day to day life to monitor and diagnose various parameter of health and fitness. 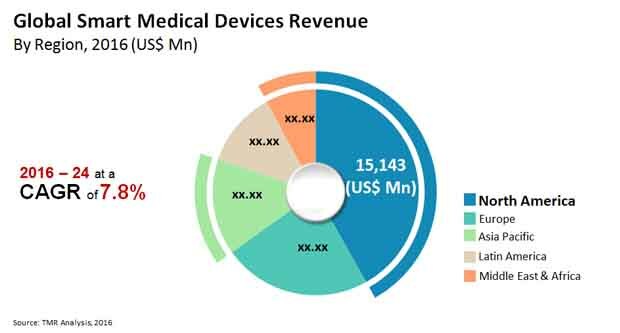 A detailed overview of market dynamics, including the drivers, restraints, and opportunities of the smart medical devices market, has been provided in this report. Market revenue for all the above mentioned segments, and their sub segments has been provided for the forecast period of 2016-2024, considering 2015 as the base year, and 2014 as the historical year, along with compound annual growth rate (CAGR %), for the forecast period of 2016-2024. Market share estimations were based on in-depth analysis and study of products, and their features, prices etc. This report provides in-depth analysis of the smart medical devices market. The stakeholders for this report include companies involved in the manufacturing of smart medical devices and its spares parts. For providing a snapshot of this market to the stakeholders, executive summary section is included in this report, which summarizes the market size, trends and competition in different regions. Market share analysis among the market players is analyzed to signify percentage share of the major players operating in the smart medical devices market. Furthermore, the report incorporates market attractiveness analysis by geography that depicts the most attractive and significant region in the global market in 2015. Based on geography, the market is segmented into North America, Europe, Asia Pacific, Latin America, and Middle East and Africa. The regions are further segmented into major countries which include, U.S., Canada, Germany, U.K., France, rest of Europe, China, Japan, Australia and New Zealand, Rest of Asia Pacific, Brazil, Mexico, Rest of Latin America, Saudi Arabia, South Africa and Rest of Middle East and Africa. The report also comprises list major players in the market, their SWOT analysis, market share of these players in the smart medical devices market, key business strategies, product portfolios, and recent developments. Key market players profiled in this report include, Abbott Laboratories, Apple Inc., Dexcom, Inc., Fitbit, Inc., F. Hoffmann-La Roche Ltd., Johnson & Johnson, Medtronic plc, NeuroMetrix, Inc., Samsung Electronics Co., Ltd, and Sonova.